The Silk Road transmission of Buddhism to China started in the 1st century CE with a semi-legendary account of an embassy sent to the West by the Chinese Emperor Ming (58-75 CE). Extensive contacts however started in the 2nd century CE, probably as a consequence of the expansion of the Kushan empire into the Chinese territory of the Tarim Basin, with the missionnary efforts of a great number of Central Asian Buddhist monks to Chinese lands. The first missionaries and translators of Buddhists scriptures into Chinese were either Parthian, Kushan, Sogdian or Kuchean. From the 4th century onward, Chinese pilgrims also started to travel to India by themselves in order to get improved access to the original scriptures, with Fa-hsien’s pilgrimage to India (395-414), and later Xuan Zang (629-644). The Silk Road transmission of Buddhism essentially ended around the 7th century with the rise of Islam in Central Asia. The first contacts between China and Central Asia occurred with the opening of the Silk Road in the 2nd century BCE. The 1st century BCE «Records of the Great Historian» (Ch:史記, Shiji) describes the travels of the Chinese explorer Zhang Qian to Central Asia around 130 BCE, who reports about a country named Shendu (India), whose peaceful Buddhist ways are mentionned in writing in the 1st century CE Han history, the Hanshu. After 130 BCE, numerous embassies to the West followed Zhang Qian’s travels, and there may have been some contacts with Buddhism around that time. Chinese murals in the Tarim Basin city of Dunhuang describe the Emperor Han Wudi (156-87 BCE) worshipping Buddhist statues, «golden men brought in 120 BCE by a great Han general in his campaigns against the nomads». However, there is no such mention of Han Wudi worshipping the Buddha in Chinese historical litterature. The Hou Hanshu also records the visit of Yuezhi envoys to the Chinese capital in 2 BCE, who gave oral teachings on Buddhist sutras to a student, suggesting that some Yuezhi had already started to disseminate the Buddhist faith in eastern Asia during the 1st century BCE (Baldev Kumar (1973)). «The establishment of the Baima Temple (Temple of the White Horse) by Emperor Ming (58-75 CE) of the Han marked the introduction of Buddhism into China. The temple was located on the south side of the Imperial Drive, three leagues (li) outside the Xiyang Gate. The Emperor dreamt of the golden man sixteen Chinese feet tall, with the aureole of sun and moon radiating from his head and his neck. A «golden god», he was known as Buddha. The emperor dispatched envoys to the Western Regions («遣使向西域求之») in search of the god, and, as a result, acquired Buddhist scriptures and images. At the time, because the scriptures were carried into China on the backs of white horses, White Horse was adopted as the name of the temple.» (Translation: Ulrich Theobald). The military expansion of China into Central Asia under the rule of Emperor Ming at that time was very real, in particular with the campaign of the general Ban Chao, who managed to repell the Xiongnu from the Tarim Basin and control most of the area by around 75 CE. These contacts necessarily prompted some level of cultural exchange, and may indeed correspond to the first time Buddhist ideas were transmited to China. The first documented transmission of Buddhist scriptures to China occurs in 148 CE, with the arrival of the Parthian missionary An Shih Kao in China, probably on the heels of the Kushan expansion into the Tarim Basin. An Shi Kao established Buddhist temples in Loyang and organized the translation of Buddhist scriptures into Chinese, testifying to the beginning of a wave of Central Asian Buddhist proselitism that was to last several centuries. In the middle of the 2nd century CE, the Kushan empire under king Kanishka expanded into Central Asia and went as far as taking control of Kashgar, Khotan and Yarkand, which were Chinese dependencies in the Tarim Basin, modern Xinjiang. As a consequence, cultural exhanges greatly increased, and Central-Asian Buddhist missionaries became active shortly after in the Chinese capital cities of Loyang and sometimes Nanjing, where they particularly distinguished themselves by their translation work. They promoted both Hinayana and Mahayana scriptures. Thirty-seven of these early translators of Buddhist texts are known. An Shih Kao, a Parthian prince who made the first known translations of Hinayana Buddhist texts into Chinese (148-170). Lokaksema, a Kushan and the first to translate Mahayana scriptures into Chinese (167-186). Zhi Yao (c. 185), a Kushan monk, second generation of translators after Lokaksema. Kang Meng-hsiang (194-207), first translator from Sogdiana (Kangju). Zhi Qian (220-252), a Kushan monk whose grandfather had settled in China during 168-190. Zhi Yueh (c.230), a Kushan monk who worked at Nanjing. 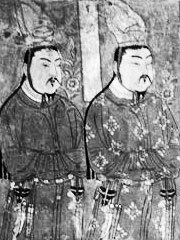 Kang Sengkai (247-280), born in Chiao-chih in the extreme south of the Chinese empire, and son of Sogdian merchant. Dharmaraksa (265-313), a Kushan whose family had lived for generations at Dunhuang. An Fachiin (281-306), a monk of Parthian origins. Po Srimitra (317-322), a Kuchean prince. Fo T’u-teng (4th century), Central Asian monk who became a counselor to the Chinese court. Bodhidharma (440-528), was, according to Yang Xuanzhi, a monk of Central Asian origin whom he met around 520 at Loyang. Bodhidharma was the founder of the Chan (Zen) school of Buddhism. «In former times, the people of Fusang knew nothing of the Buddhist religion, but in the second year of Da Ming of the Song dynasty (485 CE), five monks from Kipin (Kabul region of Gandhara) travelled by ship to that country. They propagated Buddhist doctrine, circulated scriptures and drawings, and advised the people to relinquish worldly attachments. As a results the customs of Fusang changed» (Ch:»其俗舊無佛法,宋大明二年,罽賓國嘗有比丘五人游行至其國,流通佛法,經像,教令出家,風 俗遂改.», Liang Shu «History of the Liang Dynasty, 7th century CE). Jnanagupta (561-592), a monk and tranlator from Gandhara. Shikshananda (652-710 CE), a monk and translator from Udyana, Gandhara. Prajna (c. 810). A monk and translator from Kabul, who educated the Japanese Kukai in Sanskrit texts. Central Asian missionnary efforts along the Silk Road were accompanied by a flux of artistic influences, visible in the development of Serindian art from the 2nd through the 11th century CE in the Tarim Basin, modern Xinjiang. Serindian art often derives from the art of the Greco-Buddhist art of the Gandhara district of what is now Pakistan, combining Indian, Greek and Roman influences. According to Chinese sources, the first Chinese to be ordained was Zhu Zixing, after he went to Central Asia in 260 to seek out Buddhism. It is only from the 4th century CE that Chinese Buddhist monks started to travel to India to discover Buddhism first-hand. Fa-hsien’s pilgrimage to India (395-414) is said to have been the first significant one. He left along the Silk Road, stayed 6 years in India, and then returned by the sea route. Tens of Chinese monks, possibly hundreds of them, visited India during that period. The most famous of the Chinese pilgrims is Xuan Zang (629-644), whose large and precise translation work defines a “new translation period”, in contrast with older Central Asian works. He also left a detailed account of his travels in Central Asia and India. Buddhism in Central Asia started to decline in the 7th century with the expansion of Islam there. The vigorous Chinese culture progressively absorbed Buddhist teachings until a strongly Chinese particularism developed. Central Asian Buddhist monks from the Tarim Basin and East Asian Buddhist monks appear to have maintained strong exchanges until around the 10th century, as shown by frescos from the Tarim Basin.